To do Boat pose, first find a comfortable place to sit on the floor with your toddler. 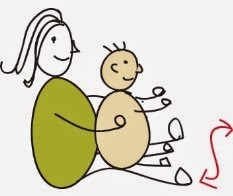 Stretch your legs out in front of you and either gently sit your toddler on your thighs facing you, or invite them to sit in between your legs (see picture above). Remember to keep smiling and talking! Holding their forearms and wrists, gently rock forwards and backwards with your toddler – like a boat on the waves. After two or three rocks, if your toddler is happy, try rocking a little faster and sing the ‘Row, row, row your boat’ song. This is a fun adaptation to do with another adult or as part of a group as your toddler can look at other people. Find a comfortable place to sit on the floor with space in front of you. Stretch your legs out in front and place your toddler on your thighs facing away from you, supporting them with your hands around their hips. Shuffle forwards on your bottom, gently rocking your toddler from side to side as you go. After you have moved forward a little way – shuffle backwards. Once again sing the ‘Row, row, row your boat’ song as you do the movements. If your toddler is enjoying the game, make the rocking movements bigger so they are challenged to keep their balance on your lap. Your toddler will enjoy the movement of their body against gravity, but do keep checking to make sure that they are not starting to feel anxious. When doing either of the above poses, with your toddler remember not to do the more vigorous rocking movements for too long as this can overstimulate them and cause them anxiety. 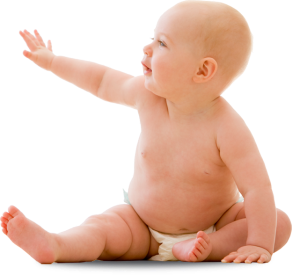 From about 3 months your toddler will have been be relying less and less on their baby reflexes. Instead they will be developing their postural control mechanism- learning how to move and control their body in space. As your toddler gently rocks back and forth with you in boat pose they will be activating and strengthening their tummy and back muscles. These muscle groups have to work together for activities such and sitting, standing, walking etc. The vestibular sense tells us where our body is in relation to gravity and whether we are moving or still, the receptors for this sense are in our inner ears (see above). This sense begins to function in the womb, at about 5 months after conception, and is well developed at birth. As your toddler starts to toddle their vestibular sense begins to play a bigger role. Helping the young brain to sort out and combine the huge variety of sensations, and underpinning their early control of posture, balance and movement. We cannot see this sensory organisation happening – but your toddler may naturally seek out spinning or rocking experiences – spinning round and round or wanting to play on the swings over and over. These vestibular sensations help your toddler to feel happy and ‘more organised’. The trick is not to let your toddler carry on for too long – as it can ‘end in tears’ as they become over-stimulated. In Tatty Bumpkin classes we use unique storylines to make activities and poses meaningful and to fire the imagination. We have carefully linked each weekly Tatty Bumpkin adventure to the 2014 Early Years Foundation Stage (England) and the Curriculum for Excellence (Scotland). ‘Surprised’ and ‘curious’ as they meet the statues. 7. Have fun with their friends: rowing across the ocean, dancing with the octopus and meeting and exploring the statues. In Tatty Bumpkin classes, the posture for this week is BOAT pose, in the sessions your child will go on an adventure with Tatty Bumpkin and dog, over the sea, to the island of statues.